Who could resist the thrill and challenge of climbing a mountain? Mt Kenya (short for Mount Kenya) offers you the chance to hike to its summit, and impress your friends with your accomplishment. Its no small feat, since Mount Kenya is the second highest mountain in all of Africa. Mt Kenya is located in central Kenya, about 95 miles north of the capital city of Nairobi. And no trip to East Africa would be complete without visiting that modern metropolis. If you are in Kenya and in the mood for mountains, you can also try a hiking trip to the top of Mt Kilimanjaro, the highest mountain of all of Africa which lies just across the border in Tanzania. There are guidebooks published for both mountains. Mt Kenya is located in the Mount Kenya National Park, so you’ll have to pay the admission fee to the park: US$ 20 per adult, with extra fees if you want to scale the cliffs rather than walk. Nearby is the Sweetwaters Game Reserve and Chimp Sanctuary, for more chances to see some African wildlife. 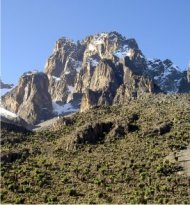 Mount Kenya has three peaks. The two highest – the Batian (5,199 metres) and the Nelion (5,188 metres) can only be reached through rock climbing. This is only for experienced mountaineers. 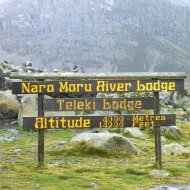 The third peak (Point Lenana, 4,985 metres) can be reached through a regular hiking trail. This is possible for anyone who’s in good shape – no mountaineering experience necessary. It’s possible to hire a guide there, and/or porters to help you carry heavy equipment. You can take your pick from about 8 mapped routes for walking up Mount Kenya. The main routes are named Chogoria, Naro Moru and Sirimon. Chogoria is the most scenic, but also the most strenuous climb. For an easier trek, try the Sirimon path. The other 5 routes are not as well maintained and you'll need permission from the local wildlife service to use them. I don't suggest bothering with the red tape, since the main routes will give you more views than you'll know what to do with. Each route has a number of lodges, huts and bunkhouses for overnight camping. Some of these are true guesthouses, and will cost you to stay. Some are literally shacks for quick camping shelter. Check with the Mount Kenya park officials for exact details. Plan to be on the mountain for several days. Especially for the descent, you’ll need 2 to 3 days, otherwise you may get altitude sickness. The scenery is spectacular, and you will see all kinds of different landscape as you make your way higher. There are fields of bamboo, forests, glaciers, lakes, and moors. Mount Kenya is a long-extinct volcano that has a number of separate peaks, as well as glacial ice. All its three peaks (Batian, Nelion and Lenana) were named after local Masai tribesmen. Mt Kenya was first spotted by a European in 1849 when missionary Johann Ludwig Krapf reported it. It was another 50 years before anyone made it to the top. Today, thousands of tourists come to the park to make the climb.